The Netgear site http://kb.netgear.com/app/answers/detail/a_id/13206 indeed has totally accurate instructions that work as advertised. I updated the laptop, rebooted, launched the utility, accessed the check for updates and the PTV1000 updated beautifully. As you can see from the screen shot above, you can watch the progress of the Push2TV device upgrade on the laptop. It took about two minutes. 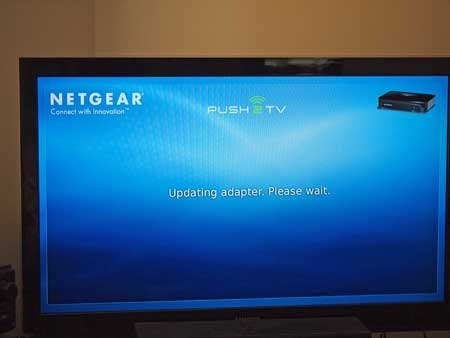 Similarly, the connected TV shows that the adapter is being updated. When complete, you will need to re-associate your laptop with the adapter just like you did when you first setup the pairing. If you’re just buying this gear, chances are that it will have the original firmware. You will need to set up the pairing with your TV prior to updating and then re-pair. 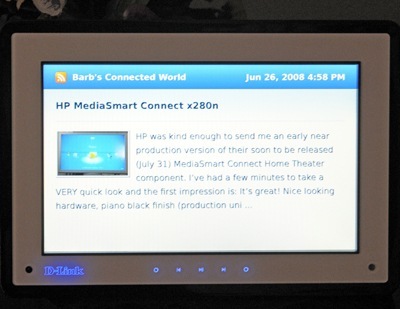 HP was kind enough to send me an early near production version of their soon to be released (July 31) MediaSmart Connect Home Theater component. I’ve had a few minutes to take a VERY quick look and the first impression is: It’s great! Nice looking hardware, piano black finish (production units will have a neat Zen imprint) with a solid heft/feel. Connections for component and HDMI (720p and 1080i supported on both). An HDMI cable is included (nice touch). Audio jacks include RCA stereo (analog) and Optical Digital (SPDIF). No Coax digital, but that suits me just fine. I ranted some about the lack of Optical output on the ”competing” (and I use that term loosely) Linksys DMA-2100. 802.11a/b/g/n (Draft 2.0n) wireless (and 10/100 Ethernet) connect this device to your home network. 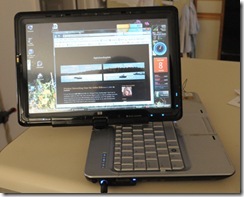 The device sports USB ports front and rear and includes a HP Pocket Media Drive Bay (the 21st century version of sneaker net storage used to move your digital “stuff” between computers and devices). If you are looking at size and aesthetics, this image shows the sizes of the x280n, the Linksys DMA-2200 (the 2100 is even smaller and as I blogged, chintzy in feel and cheap looking), the D-Link theater component size DSM-750, and an Xbox 360. For me, it is a draw between the component sized D-Link which, in the real world would fit nicely on the rack that holds my home theater receiver and the HP x280n which would fit nicely and discreetly on top of or under the TV. 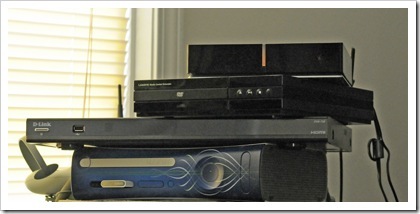 Top to bottom: HP MediaSmart x280n, Linksys DMA-2200, D-Link DSM-750, Xbox 360. HP includes a really nice handheld remote. It’s certainly the best of the remotes offered with any of the extenders I’ve seen. It’s backlit (which for me is a must in a darkened room). Setting up the x280n was menu driven and simple. It found several of my 2.4GHz “N” networks (I’m not certain it is seeing 5GHz N yet, more to come). I associated it, entered the WPA2-PSK passphrase and it was off and running. 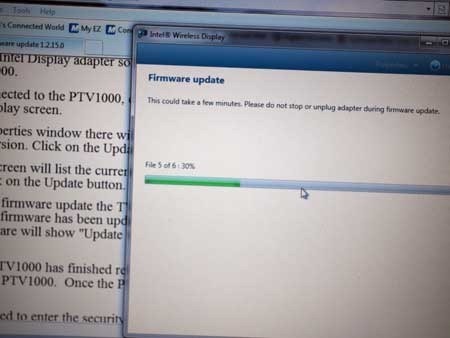 The first thing it did was check for new firmware. Finding a newer version, it downloaded and applied the newer firmware. After a reboot, it was back up and ready for action. I elected to set it up as a Media Center Extender first and verify that my OCUR/DCT high def streaming was good to go. No problem there. Since I can do MCX setups in my sleep, and at the speed of light, I was able to quickly get through setup and watch Live and Recorded HD TV. 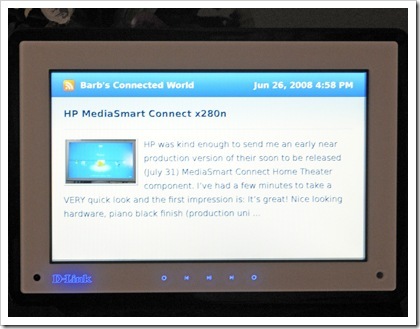 I had a short amount of time to explore HP’s MediaSmart proprietary interface for Media Sharing. I used Windows Media Sharing and UPnP streaming from a server. I have yet to setup HP’s own MediaSmart gateway software, but I’ll get to that. 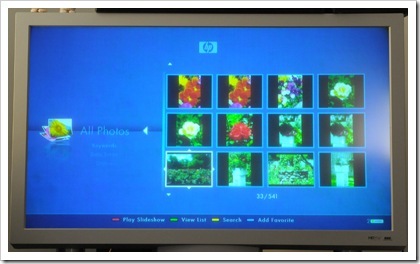 HP has developed a slick and intuitive interface which can be used with Windows XP, Vista, and most likely will be future proof, at least for a while. I like the HP interface and functionality slightly more than D-Link’s MediaLounge interface. Linksys has no such secondary interface. 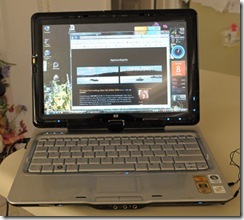 I was easily able to start playing some music and access my photos and play a slide show. This works almost exactly the same way it does on the Media Center Extender interface. All in all, in my first look, a nice, user friendly, solid piece of hardware with great functionality. I’ll be updating this post as time permits as I continue to explore and experiment. Before I left home, I recorded a few TV Shows with an external USB tuner I already owned using Vista’s Windows Media Center. (HP does have a tuner for the TX2000 but I have not had the opportunity to see/try it.) The passenger in the middle row seat on my outbound flight asked some questions as I had the TX2000 in tablet mode and was watching some of this recorded TV via Media Center. He had earbuds and I let him plug into the spare earphone port. The TV in my hotel room was an old CRT tube type and I just can’t watch those after living with LCD’s and Plasma’s. Watching recorded TV on the TX2000 was a much better experience than watching anything on the hotel television. One of the first travel incidents that happened to me was that I broke off a prong on the Jawbone BT earplug A/C power plug. It’s a two piece deal, USB plugs into the wall wart. I now very much appreciate the three USB ports on the TX2000 (and I’d definitely been scratching my head wondering how I could use three at once). One port each for my Moto RAZR phone, my IPOD Touch, and my Jawbone BT adapter. Obviously notebook has to be powered on to charge up these items, but I found a routine of waking up, plugging in, showering, etc. reading email and doing morning online stuff before leaving the hotel was enough time to charge everything for the day. Battery life on the TX2000 was pretty decent. Even with the smaller 6 cell battery installed (to save space and weight), I found that by using Power Saver mode coupled with an electrical outlet halfway through the day for a quick drink of energy that I could pretty much get through a day of presentations and meetings (not constant use). 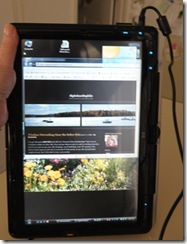 Like other true tablet pc’s, the screen can be a little hard to read in bright sunlit settings. A few times where I was sitting in an enclosed courtyard environment with natural bright sunlight I had to move around a bit and turn up the brightness. Wireless connectivity “just worked” thanks to the built in Broadcom 802.11a/b/g/n wireless radio. No matter what SSID I needed to connect to, there were no hassles. I had a chance to use the wired Ethernet as well on this trip and had no issues. Not that I wouldn’t expect this great performance, but I am sure glad that HP did not use the problematic Intel 4965 wireless chipset (lots of driver issues). After taking some NEF+JPG images with my Nikon D300, I used a Lexar Professional USB 2.0 high speed Compact Flash Reader to get images into the TX2000. While the TX2000 has a built in media reader, it does not handle the larger format compact flash cards (which is true of all other notebooks I’ve seen). I’m pleased to report that some batch processing with Adobe on this 64 bit Ultimate machine with 4 gigs of RAM is very acceptable (as compared to the TX1000 which was quite slow). It was pretty neat to put the TX2000 in tablet mode and play a slide show of the day’s photos for some friends. Speaking of friends, quite a few of them (30 or so) had some hands on with this TX2000 on this trip. Since I’d been talking about it and blogging about it, there was a lot of interest. Even folks I didn’t know (on the airplane and at the conference) wanted to take a look at the machine. Definitely thumbs up from a very discriminating crowd of geeks. Only a couple of friends that are business tablet users felt that it would not suit their specific needs. Even people I didn’t know wanted to take a look at the TX2000. On my outbound trip, TSA at my local airport at the security checkpoint said, “is this a new laptop” and went off to inspect it. I think they were curious and not alarmed. When they handed it back to me, the comment was, “this looks pretty cool”. All in all, it was a great trip. The TX2000 was a great machine to take on the road, serving all my needs. 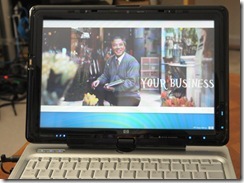 HP’s TX2000 Entertainment PC: A perfect all around notebook/tablet? Do I now have the perfect “home, multimedia, on the road and around town” mobile notebook/tablet pc? Last year I had a chance to be one of the first to get a look at HP’s TX1000. I liked it a lot (see reviews) but felt that it could be world class with a few improvements. 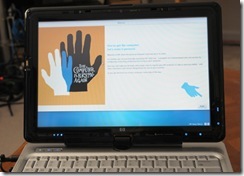 Several months later, I became involved in “Help HP Design their next notebook” along with several other bloggers. I contributed my own wishlist and submitted the entire list of comments and suggestions from readers. Basically, I want it all. I don’t want an all business notebook that is light on features that I need for my digital photography and multimedia needs, but I do want a notebook that lets me attend to personal business efficiently (Office 2007) and is fun to use. Almost exactly one year after receiving the TX1000 for review, HP contacted me and asked if I was interested in looking at the HP Pavilion TX2000 Entertainment PC. Of course I said yes. And I won’t keep anyone in suspense. I REALLY like this notebook. Below are my first and early impressions in detail. HP has listened carefully to end users. (And I don’t know of any other computer manufacturer that has gone to this much trouble to solicit feedback, yet alone incorporate it, in a consumer notebook product.) 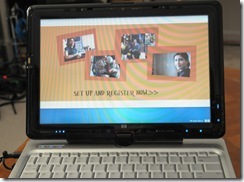 Circuit City is describing the TX2000 as an HP Pavilion TX2000 12.1″ Touchscreen Entertainment Laptop. I’m guessing that the word “touchscreen” has less of a “business only” connotation than “tablet”, but it is a true tablet pc. The nitty gritty: The machine I received was one at the top of the line. 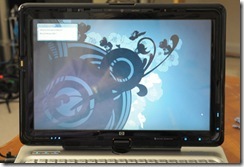 According to the website (as of April 11, 2008), models start at $899.99 for a base configuration and with HP’s recommended Config, currently cost $1168.99. Setting up and firing up the TX2000 for the first time was a breeze. HP includes their standard poster for folks that can’t figure out how to insert the battery and assemble the two pieces of the power cord. 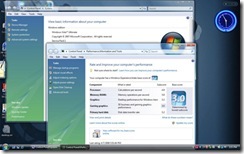 After powering it up for the first time, the typical OEM Windows Vista setup screens appeared including license acknowledgement and after Windows setup completed, HP’s own registration application. It’s all pretty slick as you can see from the shots below. A short video was next and a few screens asking me if I needed an Internet provider. Since I’m a very happy Comcast broadband user, I was all set. HP’s default wallpaper is shown below. This same design is imprinted (black on a striking piano black finish) on the top pf the notebook. I “pointed” the a/b/g/n wireless at one of my 802.11n (draft 2.0) networks and was off and running, actually speeding. Windows Vista downloaded a ton of updates while I looked around and worked on personalizing my drive configuration. The 250GB hard drive was configured as a single volume (Drive C) and one of the first things I did was change the hidden recovery partition drive letter to F and then shrink the C drive, create a D drive and format as NTFS. I like to keep my data (including images, videos and music) on a non system drive. Old habits die hard! There’s no question that the TX2000 is an Entertainment Notebook PC (and is deserving of that label). The stereo speakers (Altec Lansing) are quite good for a laptop. I’ve certainly seen my share of crappy, tinny laptop speakers driven by cheap chips over the years). There are TWO earphone/earbud out ports. Couple this with tablet functionality and turning the TX2000 into tablet mode, watching a DVD on an airplane with a travel companion is a great experience. Both of you can enjoy the DVD while everyone around you can watch the movie offered by the airline that you’ve already seen twice. I carry some great Shure sound isolating high performance earbuds which provide an incredible experience, but entry level inexpensive earbuds are available as options from HP with the TX2000. It’s not a bad idea to carry a set of these if you want to share with someone not carrying their own earbud gear. 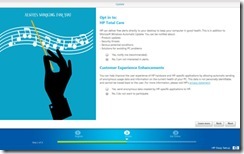 HP includes Quick Play button functionality (which launches Vista) to give you one button access to your music and more. Kitchen sink aside, HP includes a link to SlingMedia’s web site for a 15% discount on a Slingbox (and the Sling Media player is pre-installed). StarZ Vongo is also pre-installed. The basic version of muvee autoProducer is pre-installed (along with the option of activating a 21 day free trial of the fully featured version). Cyberlink full version software is also pre-installed: Power Director 6 (for the Steven Spielberg in you), Power2Go v5 (media burner), Label Print and YouCam (webcam effects). 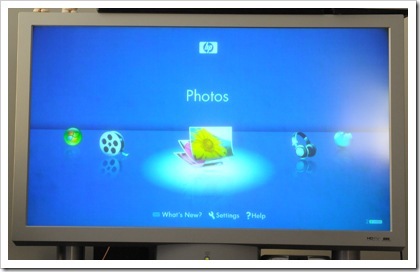 HP Photosmart Essentials is also included. Electronic Arts Trial Version of Sims Life Stories is also pre-installed. It’s not really my “thing” but HP certainly includes a rounded selection of entertainment vehicles. HP included a lot of other software (loaded to the gills, actually), including a 60 day trial version of Microsoft Office 2007 Student and Teacher (which I am replacing with a full Office 2007 Ultimate and Expression Web). The S&T version may be just right for the average user, but I’m accustomed to the Ultimate version of Office 2007 and I do author PowerPoint decks. Also preinstalled was a 60 day trial of Norton Internet Security. Norton is one of my least favorite apps, and after 10 minutes, I uninstalled it (and substituted Eset’s NOD32 which I like a lot as it is lightweight but strong). I do understand the need to include a working AV product out of the box. 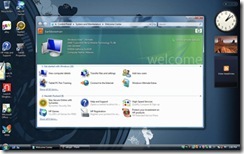 Much of the included software has easy access shortcuts on the default desktop and/or in the system tray, but some only appears on the Programs menu. The TX2000 is currently shipping with updated drivers and Vista Service Pack 1 pre-installed. This means that out of the box, the machine doesn’t need to download hundred’s of megabytes of updates and fixes and that the drivers are SP1 compatible. (My review unit needed some updates from the HP Support site, including a BIOS update and some drivers, but HP has one of the best systems I’ve seen and their “Softpaqs” are nearly bulletproof. After installing the HP updates, I made a few passes at Windows Update and downloaded and applied a few rounds of updates before SP1 was offered.) After Vista was done downloading about 121 megs, SP1 installed in about 25 minutes. The networking options for wireless vary, but the higher end selection of a/b/g/n (draft) 802.11 with Bluetooth certainly meet all my criteria. The hard drive choices are 160, 250, or 320 GB 5400 RPM SATA. For an optical drive, HP included a LightScribe SuperMulti 8X DVD+/-RW with Double Layer Support. Like the TX1000 series, the TX2000 NVIDIA(R) GeForce(R) Go 6150 graphics chip drives the display. Video memory is shared and not dedicated (one of the few things I dislike). You can, however, alter the amount of dedicated memory in the system BIOS settings. The Video rating is what drives down the overall Windows Experience rating. In spite of the rating system (which I don’t think really represents any real time normal usage), I’m happy with the performance of this notebook. The TX2000 has 3 USB ports (but no Firewire-fortunately the ExpressCard 34 firewire cards I bought work just fine so I can hook up my Canon HV20 camcorder and import and edit video). Video out is VGA (I’d prefer HDMI or DVI). A 12.1 inch screen runs a max resolution of 1280 x 800. It weighs about 4.5 pounds and at its thickest is 1.5 inches. After using the fingerprint reader on the original TX1000, I don’t think I’d consider purchasing any notebook or tablet that didn’t include one. I use the TX2000’s fingerprint reader for convenience. Much easier than typing in long passwords on web sites and having it actually encourages me to use different strong passwords for individual websites. One trick I learned living in a changeable climate where outside is 10 degrees and inside is 70 – my fingers when cold don’t register the same way as they do when at normal room temperatures. So on each hand, I’ve registered two fingers at room temperature and two more when I’ve just come inside from colder weather. And I have a warm and cold thumb as well. This insures quick and positive authentication. While providing business class tablet pc features, the TX2000 is an entertainment centric pc. As I look around at what is available from manufacturers that include true tablet functionality, a webcam, fingerprint reader, media center and music player functionality, the TX2000 stands alone and in a class by itself. This would actually make a great business machine. While I doubt Enterprise IT types would be interested in mass deployment (sadly), anyone with a small or home based business should take a good hard look at this one. I’ve got a friend in the real estate business that would LOVE the TX2000. Anyway, I’m about to take the TX2000 on an extended road trip. I’ve loaded up both Adobe’s photo processing software and Nikon Capture NX as I plan to do some digital editing of what I shoot with my D300. I’m hoping that the weather cooperates. The TX2000, my Nikon D300 and various necessary odds and ends all fit nicely in my Kata 101 photo backpack. I’ll be posting a follow up on performance (and more) after my return. In the meantime, I see that Circuit City is starting to receive a pre-configured model, so if you want to check the TX2000 out yourself..